This machined finish wheel center cap fits the 1993-1996 Cadillac Fleetwood with the 15" web design aluminum wheel only (see example photo). It is used with typical wear and tear / scratches etc. The price quoted is per center cap. SOLD AS-IS! They should look a little better after a good cleaning, but that will be entirely up to the new owner. This is the only set I have. Hard to find! What you see is what you get! Compatibility chart is for suggested applications ONLY and is based on factory part numbers and manufacturers suggested applications! Cadillac Fleetwood Brougham Wheel Center, 1993-1996 7.5"
Aluminum wheel center for a 1993, 1994, 1995, or 1996 Cadillac Fleetwood Brougham. Polished edge, not the machined finish. OEM parts in great used condition, see pictures. PART #6736. Hard to see in the photos but background in center of cap is maroon in color. Mostly good clean condition, all mount tabs intact and strong. Here is one usedoem Cadillac Fleetwood wire wheel center cap. SOLD AS-IS! LOOK CLOSELY! The bad news is that the top right cap has a crack in the center emblem (see photo #3) and all of them need to be polished/buffed. They should look a little better after a good polishing, but that will be entirely up to the new owner. 1993 -1996 Fleetwood. Always COMPARE the part number on this cap to the part number on the cap from your vehicle. Part numbers are stamped on the back of the hub cap or center cap. One of our photos in the ad shows the part number. Trending at $18.65eBay determines this price through a machine learned model of the product's sale prices within the last 90 days. Fleetwood '91-93 FWD, 15x6, alum, 14 slot. This is ONE good used center cap off a19 92 Cadillac Deville. DeVille '91-93 15x6, alum, 14 slot. Compatible with Fleetwood models. Fits: 1993, 1994, 1995, 1996, 1993 93 1994 94 1995 95 1996 96. This aluminum wheel hub cap is presentable with noticeable dings and scratches. Also looks nice for being in used condition and are ready to be installed. (SEE 2ND PICTURE FOR SIZE). Part number 6736. Check out the pics. all the tabs are still there. Great for a driver car. 1993-1994-1995-1996 Cadillac Fleetwood. If this is a used item. It will show light wear from use. Expect normal wear appropriate with the donor vehicle's age. 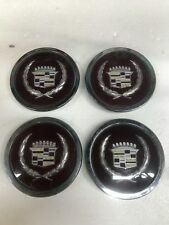 4X CADILLAC BLACK 65MM WHEEL CENTER CAP DECALS/ STICKERS. 1993 - 1996 CADILLAC FLEETWOOD BROUGHAM rear wheel drive ORIGINAL EQUIPMENT WHEEL CENTER CAP IN GOOD USED UNDAMAGED CONDITION AS PICTURED. MATCH THE PHOTO TO YOUR APPLICATION. 1993-1996 CADILLAC BROUGHAM FACTORY GM OEM WHEEL CENTER CAP. THE FACTORY GM PART NUMBER IS # 10172911. BOXED WAREHOUSE CS11. Item being listed for sale is for 1981 - 1985 Cadillac Fleetwood Brougham RWD Seville Eldorado. ONE of FOUR wire wheel hubcab center emblems OEM. Silver 1995 Cadillac Fleetwood Brougham. Center Cap Silver for 15" Wheel. RWD vehicles with 15" wheels ONLY. 4x 56mm 2.2" Auto Car Wheel Center Hub Cap Emblem Badge Decal Sticker. 4x Wheel Center Hub Cap Emblem Sticker. Material: Made With High Quality of Aluminum Alloy. Perfect decoration and protection for your car. 4X Cadillac Wheel Center Hub Cap Stickers Car Logo Emblems Decal Badge 55mm. Universal fit for all cadillac. Clean the car surface before sticking it. 4× Wheel Center Hub Cap Emblem Sticker. Universal fit for all cadillac. Clean the car surface before sticking it. Universal fit for all cadillac. Material: high quality ABS Aluminum. Clean the car surface before sticking it. We will work with you to solve any problem. 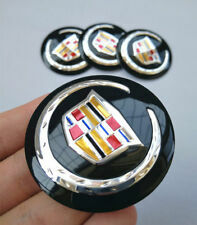 4x wheel center cap sticker with Cadillac emblem. These are the stick on application kind. It is best to clean the application area before sticking the item down. There is also a clear protective film over the emblem on the front. 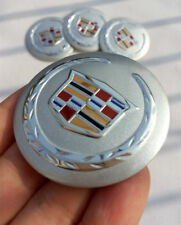 4x wheel center cap sticker with Cadillac emblem. - Universal fit Cadillac. These are the stick on application kind. It is best to clean the application area before sticking the item down. There is also a clear protective film over the emblem on the front. Material：ABS Plastic. Color：Black. We will reply you within 24- 48 hours. Universal fit for most of car model. Clean the car surface before sticking it. Hope u can understand. We will work with you to solve any problem. Material: high quality ABS aluminum. Universal fit for most of car model. Clean the car surface before sticking it. Hope u can understand. 4x wheel center cap sticker with SSR emblem. - Universal fit SSR. These are the stick on application kind. It is best to clean the application area before sticking the item down. There is also a clear protective film over the emblem on the front. The item being listed is for a set of 4 - 93' to 96' Cadillac Fleetwood BroughamNormal wear and tear, surface scratches. P/N 10172911 7&5/16". or need a full set. Part: WIRE HUBCAP, WIIRE WHEEL COVER. 1991 1992 FLEETWOOD BROUGHAM. Model(s): Fleetwood Brougham. Make: Cadillac. Year: 1991 1992. WIRE WHEEL COVER, HUB CAP. During the warranty period Cadillac King will replace the defective product.